SolutionsPT have been providing industrial IT solutions for clients including AkzoNobel, Network Rail, Müller Dairies and Lucozade for almost 30 years. They are the sole UK & Ireland distributor of Wonderware – market-leading real-time operations management industrial software that connects people, processes and information. SolutionsPT’s expertise is critical to ensure that their customers increase the performance and efficiency of their systems and reduce downtime, maximising ROI and the lifetime value of their systems. 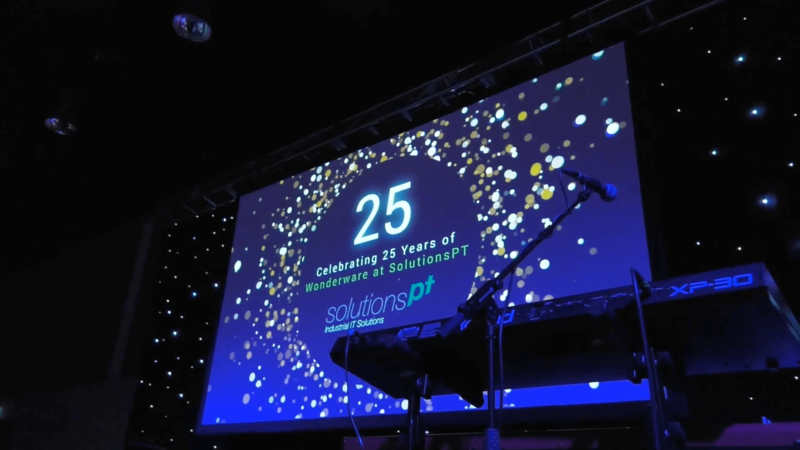 To deliver a strong event branding solution that would help them unveil the next generation of Wonderware at a two-day conference at the International Centre in Telford. One of the biggest events in their history, their audience was made up of over 200 customers and partners from all corners of the globe. The event helped our client demonstrate how the latest generation of the software works, and present it as a real game changer in the industry. 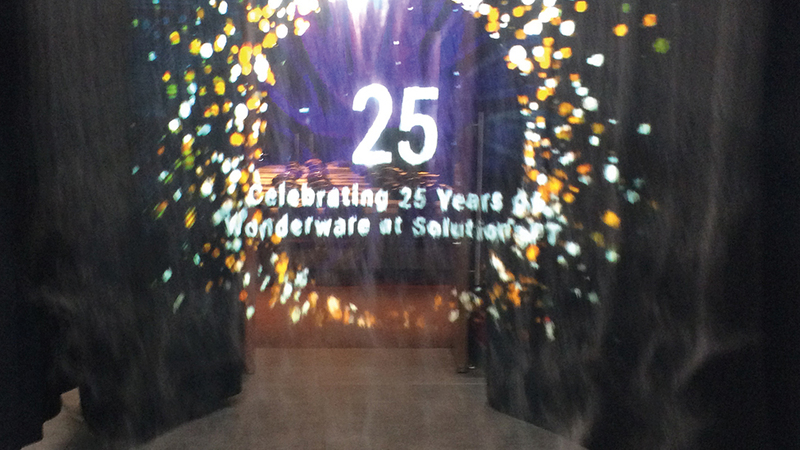 The solution also had to serve to celebrate the 25th anniversary of the company’s exclusive distribution partnership. 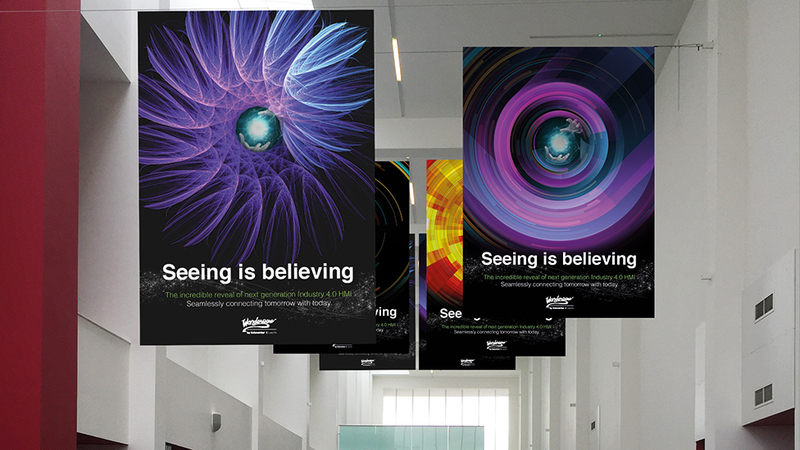 The branding we developed for Wonderware’s Next Generation Conference captures the essence of the product by focusing on the idea that ‘Seeing is Believing’, and positions our client as a company that delivers on its promises. The concept allowed us to build on the face-to-face demos that delegates would experience at the conference, and connects the manufacturers of today with the technology of tomorrow in an interesting way. Building on the plasma ball generated by Wonderware themselves, we generated graphics in the shape of an eye that convey the idea of a point of vision focus. We also introduced a secondary message that helps sum up the benefits of the product: ‘Seamlessly connecting tomorrow with today’. A fog screen displaying eye-catching content contributes to a truly immersive experience as delegates walk through to gather for on-stage presentations. We used a variety of backgrounds as transitions and applied different illustrative approaches. The branding was flexible enough to allow us to apply it to printed and digital materials: invites, email and microsite, registration area, delegate ID lanyard and badges, signage, table toppers and a corporate video.